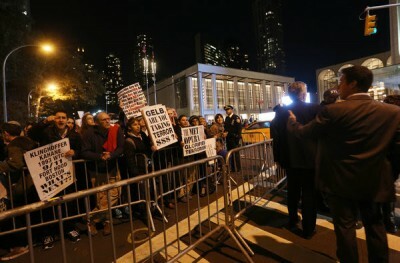 At the Metropolitan Opera’s first performance of John Adams’s “The Death of Klinghoffer” on Monday night, men and women in evening attire walked through a maze of police barricades, while protesters shouted “Shame!” and “Terror is not art!” One demonstrator held aloft a white handkerchief splattered with red. Others, in wheelchairs set up for the occasion, lined Columbus Avenue. Political figures, including former Mayor Rudolph W. Giuliani, joined a rally, several hundred strong at Lincoln Center, to denounce an opera that has become the object of a charged debate about art, anti-Semitism and politics. But after months of escalating protests, including threats of opera officials and online harassment of the cast, “Klinghoffer” finally went on, only a few minutes late. There were cheers when David Robertson, the conductor, arrived in the pit and a few boos after the opening “Chorus of Exiled Palestinians” ended. By the time opera ended, with a roar of cheers when Mr. Adams took the stage, there had been two major disruptions: Before the intermission, a man shouted “The murder of Klinghoffer will never be forgiven” several times before being escorted out, and during the second half, just after the character of Leon Klinghoffer was murdered, a woman cried out a vulgarity and left, accompanied by ushers. Met officials said at intermission that the man had been arrested on charges of disorderly conduct. Peter Gelb, the Met’s general manager, said then that he thought the performance was going well. “Klinghoffer,” considered a masterpiece by some critics, has long aroused passions, simply because of its subject matter: the murder of Leon Klinghoffer, an American Jewish passenger in a wheelchair, by members of the Palestine Liberation Front during the 1985 hijacking of the Achille Lauro cruise ship. But the 1991 opera arrived at the Met at a moment when many Jews are anguished by anti-Semitic episodes in Europe and reactions to the conflict this summer in Gaza. It also ignited what sounded at times like a revival of the culture wars of the 1990s, in which works of art became fodder for intense political debate. Mr. Giuliani, who said he had intervened in Brooklyn because he did not believe public money should have been used to pay for the exhibition, said that unlike some of the other protesters, he was not calling for the production to be canceled, and he called for peaceful protests. Unlike many of the opera’s critics, he has listened to it and read the libretto. Security was tight at the opera house, with many uniformed police in sight and all bags checked. Mr. Gelb, the Met’s general manager, addressed the performers and musicians at Friday’s final dress rehearsal to tell them about enhanced security measures. The large rally across from Lincoln Center drew some Jewish leaders, and current and former elected officials like former Gov. David A. Paterson, a Democrat, and Representatives Carolyn B. Maloney, a Democrat, and Peter T. King, a Republican. One protester at the rally, Hilary Barr, 55, a pediatric nurse from Westchester County, said she believed the opera made excuses for terrorism. “By putting this on a stage in the middle of Manhattan, the message is, ‘Go out, murder someone, be a terrorist and we’ll write a play about you,’ ” she said. The opera, and the Met, were also defended by some artistic figures. The protests were initially led by several smaller Jewish groups and conservative religious organizations. The larger Anti-Defamation League brokered a compromise with the Met, which pleased few on either side, in which plans to show the opera to a wider audience in movie theaters were dropped, but the New York production would otherwise go on. 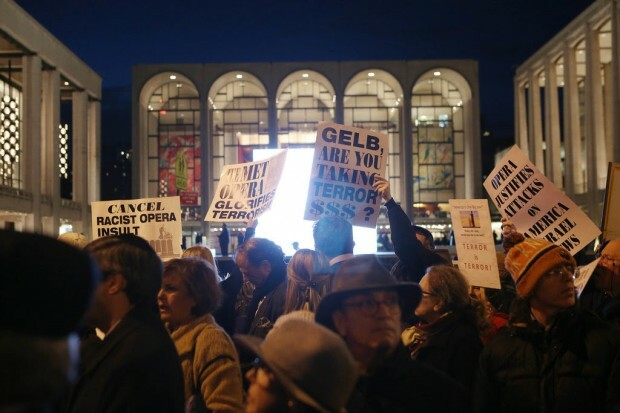 Leaders in the more liberal Reform Judaism movement have condemned the opera, but did not call for its cancellation.